The BTR-80 8x8 armoured personnel carrier. 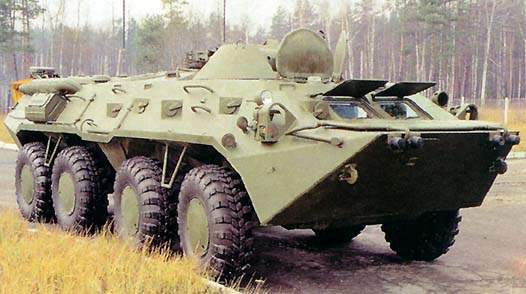 The BTR-80 Armoured Personnel Carrier. 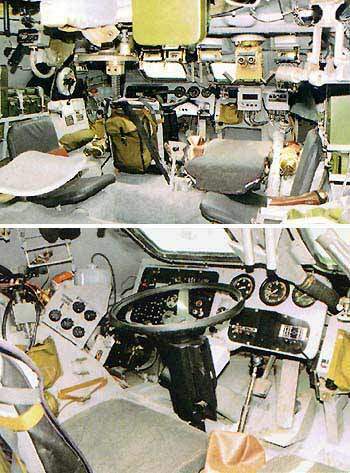 The Gunner's and Driver's stations. The BTR-80K Command APC fording. The BTR-80S showing side entrance. The new BTR-90 builds on the success of the BTR-80. The BTR-80 8×8 armoured personnel carrier, manufactured by the Arzamas machinery Construction Plant of Nizhny Novgorod, Russia, is intended to carry personnel on the battlefield and provide close fire support. It can also carry out reconnaissance, combat support and patrol missions. It entered service with the Russian Army in the late 1980s and has since been used in a number of military conflicts, including UN peacekeeping operations. The vehicle is in production and the Russian Army ordered 100 in 2006. The vehicle is also in service with the Ukraine and has been sold to Hungary, Turkey, Macedonia and Bangladesh. "The fully amphibious BTR-80 is equipped to carry ten personnel." 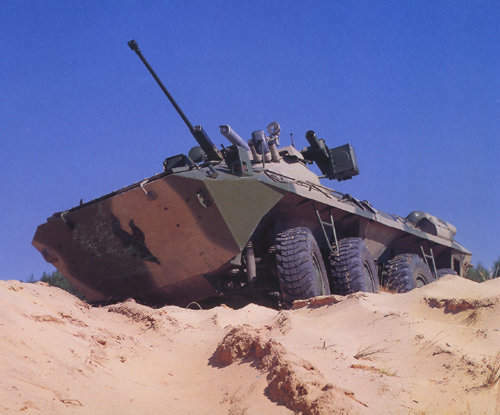 The following vehicles have also been developed from the basic BTR-80 armoured personnel carrier: BREM-K armoured recovery and repair vehicle; BMM armoured ambulance vehicle; RkhM-4-01 radiation and chemical reconnaissance vehicle; and 2S23 Nona SVK 120mm self-propelled gun, in service with the Russian Army since 1990. An enlarged version, the BTR-90 with improved armour protection, has been developed. The BTR-90 has a 30mm 2A42 automatic cannon and is capable of mounting a launcher for the Konkurs anti-tank missile system. BTR-90 entered production in May 2008. In July 2005, Bumar, a Polish company, was awarded a contract by the Iraqi Ministry of Defence for 98 reconditioned, ex-Hungarian Army BTR-80 APCs. The first three vehicles, which were newly built by Nikolayev of Ukraine, were delivered in September 2006. Bangladesh ordered a further 60 BTR-80 APC vehicles for use in UN peacekeeping missions. Deliveries completed in April 2006. The fully amphibious BTR-80 is equipped to carry ten personnel: commander, driver/mechanic, gunner and seven troops. There are seven ball-swivel firing ports in the vehicle hull, four on the right and three on the left side of the vehicle, as well as ports in the upper hatches of the firing compartment. The hatches have armoured doors and are situated on both sides of the vehicle. 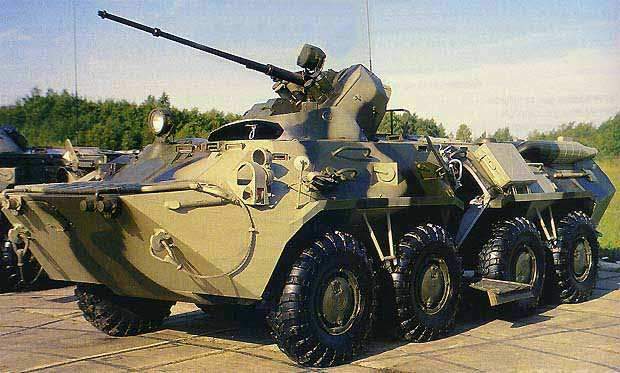 The BTR-80 is fitted with NBC (nuclear, biological, chemical) protection system, automatic firefighting system, camouflage devices, bilge pumps and a self-recovery winch. BTR-80 personnel carrier has a BPU-1 turret machine gun mount, which houses 14.5mm KPTV and 7.62mm PKT coaxial machine guns. 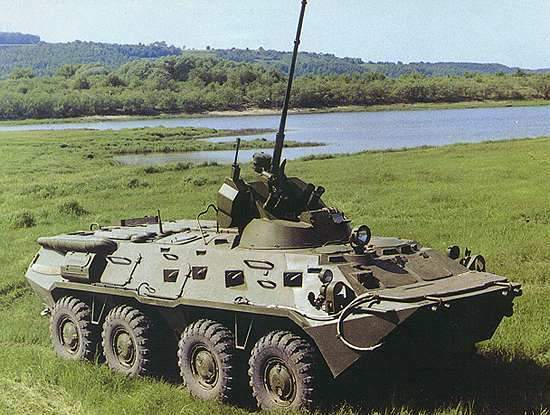 "BTR-80 is capable of a speed of 80km/h on paved road and 9km/h when afloat." The 14mm gun has a full 360° traverse with an elevation of 60° for improved effectiveness in air defence. The range of this gun is 2km. The range of the 7.62mm gun is 1.5km. Ammunition load for the KPVT machine gun is 500 rounds, with 2,000 rounds for the PKT machine gun. There are six smoke grenade dischargers, three fitted either side of the main gun. The vehicle is powered by a 7,403 four-stroke, eight cylinder liquid cooled diesel engine, which provides 260hp. It is capable of a maximum speed of 80km/h on paved road and 9km/h when afloat. Fuel endurance range is 600km on roads. The BTR-80K is intended to enable the infantry battalion commander to command sub-units and maintain communications with headquarters. It is based on the BTR-80, with the same 14.5mm and 7.62mm machine guns, but has a number of extra systems necessary for this mission. These include: two VHF-173 radio sets, antenna device set for UHF antenna, IFF automatic interrogator, TNA-4 navigational aid, PAB- 2M artillery periscope aiming ring, TNP-165A night vision sight and TSh-4 interphone headsets with GVSh-T-13 head and chest set. "BTR-80 has a BPU-1 turret machine gun mount, which houses 14.5mm KPTV and 7.62mm PKT machine guns." On the BTR-80A (in service since 1994) and BTR-80S, the standard BTR-80 turret is replaced with a modular armaments system. The BTR-80A is fitted with a 30mm 2A72 automatic gun and 7.62mm PKT coaxial machine gun. The 30mm gun has a maximum firing rate of 330 rounds a minute and can fire AP-T (armour piercing – tracer), HEF-I (high-explosive fragmentation – incendiary) and HE-T (high-explosive – tracer) rounds. 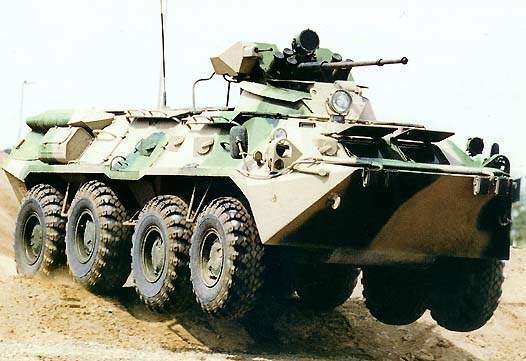 The BTR-80S is equipped with 14mm KPVT machine gun and 7.62mm PKT coaxial machine gun. For both these modifications, the armament system can be altered to fit customer requirements. The armament sighting system is manual. The fire control system includes a dual magnification day sight and x5.5 night sight.